On Wednesday, September 12, Malaysians were confronted by the gruesome news of a pregnant cat found murdered in a dryer of a laundry in Kuala Lumpur. The horrible discovery was made by unsuspecting customers who were about to unload their washed, wet laundry into the dryer for drying. Instead of an empty, clean dryer, what they found inside made them feel so disgusted. A female cat, which was pregnant incidentally, dead and covered with its own blood. 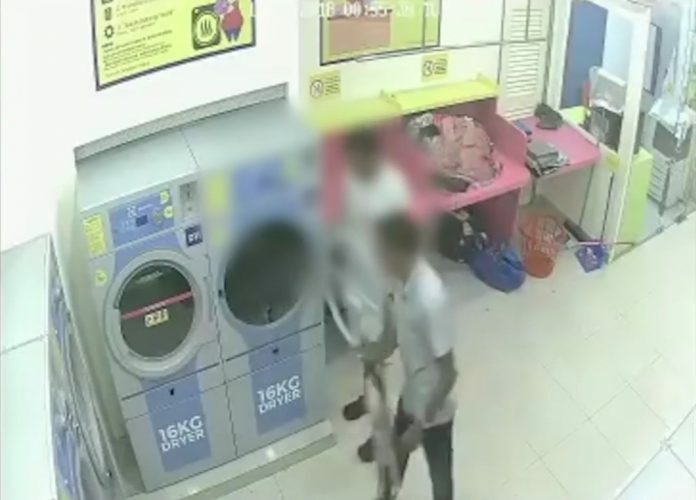 They quickly alerted the owner of the self-service laundry who then made a police report of the cruel act caught on his laundry CCTV. Local news portal Kosmo! reported that the owner knew the perpetrators of that cruel act as they were regular customers but that he did not know their names. Based on the CCTV recording, they looked like foreigners and not locals. The owner proceeded to release the CCTV clip of the despicable act to media outlets as well as the Malaysia Animals Association. Both the Malaysia Animals Association and Malaysian Response Team, also an animal rights group then uploaded the said clip onto their Facebook page and lodged a police report of their own. Based on the CCTV recording, the incident happened shortly after midnight on Tuesday, 11 September at a time when there were not many other customers around. Many strongly condemned that vile act of animal cruelty and strongly urged the authorities to apprehend the people responsible. In fact Malaysia Animal Association went as far as releasing the personal details of one of the suspects, though it remained unclear how they came about it. Media outlets have refrained from publishing the same details for legal reasons. The Gombak police confirmed to the public that they had received reports about the incident that took place at the laundry located within Gombak. By Friday, 14 September the police had arrested two suspects and were seeking a third accomplice.Gombak district police chief Assistant Commissioner Samsor Maarof confirmed the arrests to the press. He further explained that the case was being investigated under Section 428 of the Penal Code for cruelty towards animals.If found guilty, they are liable to a fine or three years in prison or both. Since the brutal incident became public, Malaysians have taken to social media to vent their frustrations and sheer abhorrence. A mostly animal-loving lot, many Malaysians expressed how that despicable act struck a most sensitive chord within them. An example is local artist Faizati’s drawn depiction of the murdered cat. 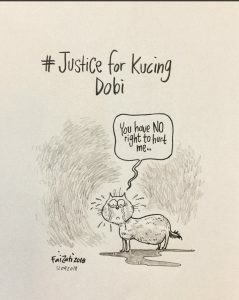 Next to the picture was the hashtag #JusticeforKucingDobi, meaning ‘Justice for laundry cat’. It has since gone viral with many Malaysians citing the same hashtag on the Facebook, Instagram and Twitter pages in solidarity for their love for animals.